I was quite excited when this CD fell out of the packet as I thought that I was a bit of a John Mellencamp fan; but soon realised that the songs that I liked are now 25 years old. What little I knew about his work in the intervening years is that he keeps trying to ‘live down’ his Pop years and wants to be considered a ‘real singer-songwriter’, which is a shame as Scarecrow and American Fool have both stood the test of time and possibly even paved the way for the genre Americana; which is something that won’t be said of NO BETTER THAN THIS. The album was produced be T-Bone Burnett and recorded with a single RCA DX Microphone on a vintage Ampex Tape Recorder in Sun Studios, a Baptist Church and an old hotel room that Robert Johnson stayed in for added authenticity but the songs all still sound like a karaoke homage to Townes Van Zandt at best. Perhaps John and T-Bone were going for a Cash style re-invention but, I’m sorry to say it hasn’t worked. The album is ‘very alright’ and totally inoffensive but all 13 songs are forgettable. Mellencamp’s voice sounds weary and worn and the guitars and backing musicians all sound responsive which is ideal for this type of music but the bottom line is the songs just aren’t strong enough. 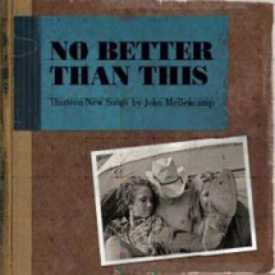 Perhaps if Mellencamp had simply recorded a Townes Van Zandt tribute album or even a series of classic Americana songs, NO BETTER THAN THIS may have worked, but as it is; it is destined for the Sale rack.